Chef David Gillott is the owner of Four Gables Group, which is based on a smallholding in Ashtead. David and his team cater for events from weddings to fine dining tasting menus at clients’ homes as well as conferences and catering contract management. This delightful summery recipe was created for us by chef David Gillott, owner of Four Gables Group. The sweet, juicy cherry tomatoes encased in a crisp puff pastry crust make for a wonderful light lunch dish, or an impressive starter for an al fresco dinner party. 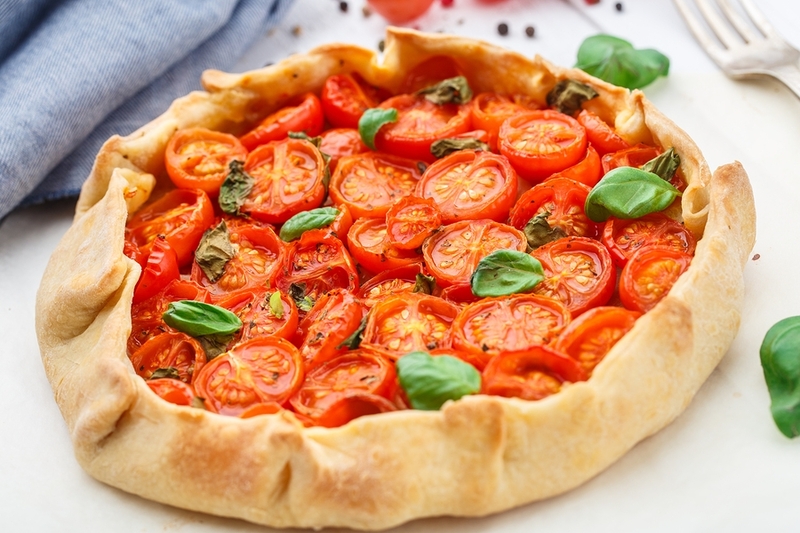 Place the tomatoes into a 20cm ovenproof frying pan with vegetable oil, salt and pepper and honey. Pack them in as tight as possible and sprinkle with the breadcrumbs. On a floured work surface, roll out a circle of puff pastry the same size as the top of the frying pan. Place the puff pastry over the tomatoes, tuck the pastry in nice and tight to hold everything together. Brush the pastry with the lightly beaten egg on the top only. Its all about creating crusty and crunchy pastry! Bake in the oven for 20 minutes, or until the puff pastry is golden brown. Remove from the oven and leave to sit for a few minutes, then tip away liquid and put a large plate upside down on top of the frying pan. Using oven gloves, press the plate down hard and then quickly flip the whole thing – you will be left with a perfect looking tatin. Remove the frying pan. Once the tart is cold, rip up some basil leaves and spoon over the extra-virgin olive oil. Add salt and freshly ground black pepper to taste.